Our summer has been full of travel, and in each place we visited, we have seen some fascinating wildlife. In Canada, there was the moose wandering the woods near our friends’ home, the mother grizzly bear and her three cubs alongside the Trans-Canada Highway, and the Great Gray Owl perched on a fence post at the foot of the Rockies. In the Colorado Rockies, it was the beaver dams and the fish swimming in mountain streams. In Pennsylvania, a distant stag caught my eye while I was walking alone one evening. Even the fireflies that hovered above the lawns in Indiana and Ohio were fascinating; we don’t get fireflies around our home for some reason. Every place we went gave us experiences of fauna we just don’t see at home in coastal Georgia. But in the week and a half since we came home, as we have settled back into the routines of work and school, I can’t seem to escape the wildlife in my own yard. A hummingbird has taken possession of our feeder; we have watched him chase away the rest of his species any time another comes near. Throughout the day, even in the middle of a rain storm, his ruby throat and emerald back hovers as he snacks on the diluted simple syrup we offer. The larger kinds of birds came back quickly when I filled our bird feeder, too, and have stuck around to see what else they can get out of me. Blue jays and cardinals come and go as they please; the mourning doves bob their way across the lawn; house sparrows and other small birds rush in and out. The squirrels have gratefully come back to the feeder, too, and even a pudgy brown rat draped his long, bare tail over the side the other day as he munched on the seed. Unfortunately, it is because of him that the bird feeder will have to remain empty for a while. We know from experience that the one brown rat will bring his friends, and we really don’t want them that close to our house. The only way to discourage them is to take away the food. Still, the birds hang around, and it is good to see them again. Yesterday, a tiny frog came leaping out of the folded lawn chair as I moved it to sweep away leaves that had gathered under it. I was not surprised; I have come to expect these little guys who seem to appreciate the safety and comfort of the canvas. A butterfly has flitted around our back yard for the past couple of afternoons. 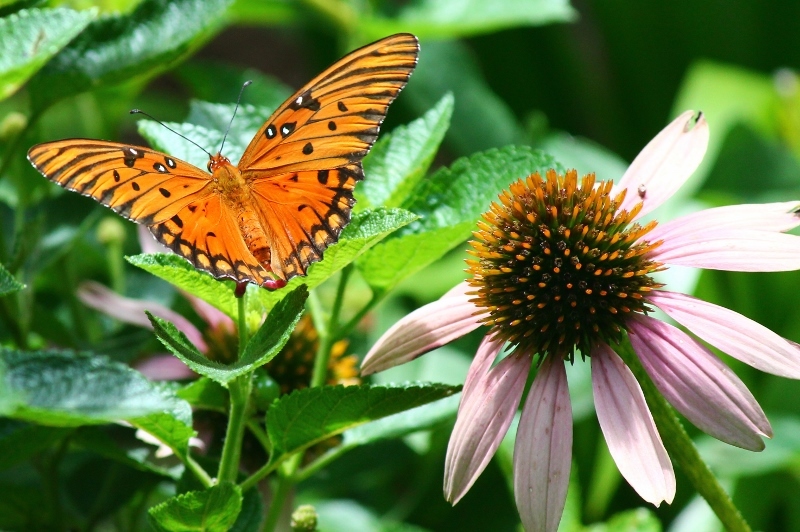 If I have identified her right, she is a Gulf Fritillary. She made an appearance this afternoon to snack on the nectar of our lantana in the back yard and stuck around long enough to pose for a few photos before she wandered her way into another yard. 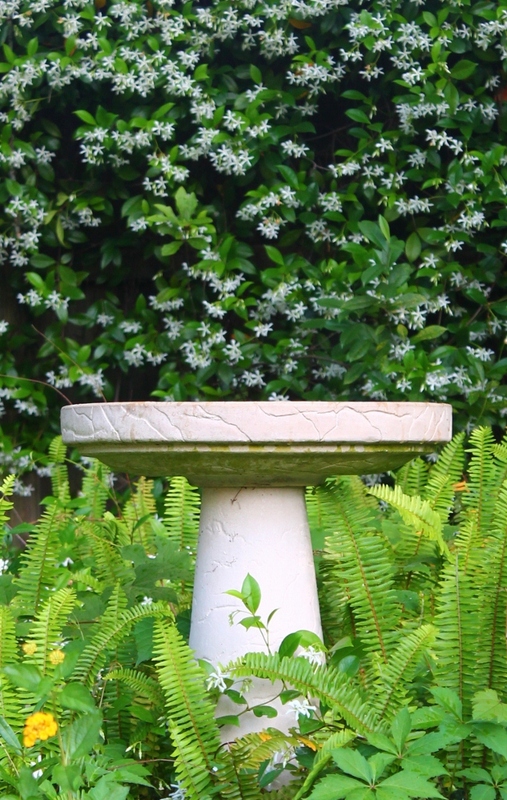 Earlier, a proud robin with his pronounced rusty chest stopped for a little dip in our bird bath. When I headed to the door with my camera to see if he would stick around, our dog decided he wanted to go out, too. But I think the robin was done with his bath by then anyway, and he flew elsewhere. And maybe it is because of our wet summer, or maybe it is just the time of year, but it seems that this is a good time for young anoles to come out. I have adorable juveniles and gawky-looking teenagers of that species all over the yard. Soon, they will grow big enough to become territorial, but tonight, I watched as at least two young ones climbed and dashed up and down and in and out all over the same bunch of black-eyed susans. One was brown, another was bright green; they can switch back and forth depending on their mood. These little creatures never had the care of a mother; she simply laid the eggs a few weeks back, and the lucky ones emerged to tackle life more or less on their own. Most of this wildlife in my yard is unremarkable. These are common species of birds, mammals, insects, amphibians, and reptiles which share this little plot of land with us and with most of our neighbors along the Atlantic and Gulf coasts for a thousand miles. But as I thought about all that wildlife in my yard this evening, I felt the presence of God in a way I didn’t when I saw the wildlife in other places. The moose and grizzlies were remarkable. The great gray owl and high-antlered deer were beautiful. Even the midwestern fireflies and mountain stream fish were fascinating. But none of them spoke to me of the presence of God in the same way as my familiar anoles, robins, butterflies, and tree frogs. Seeing those grizzlies and moose in the wild was a once-in-a-lifetime experience. 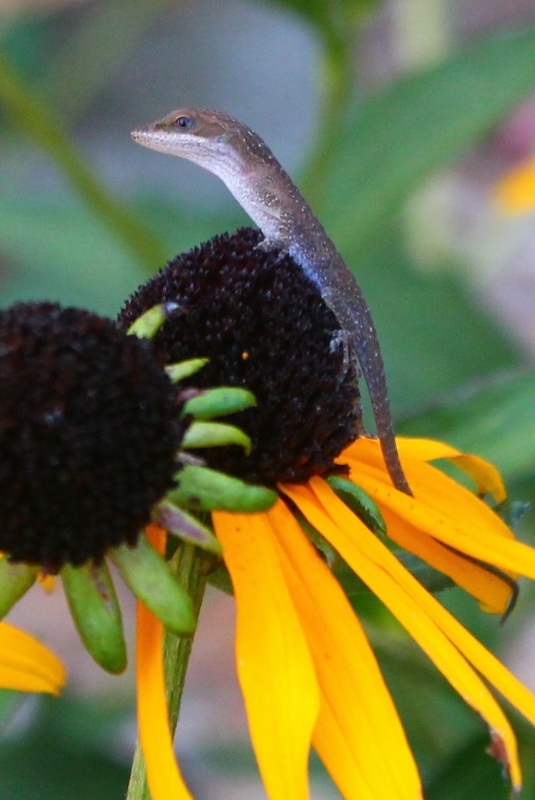 But God is more like the anoles, which surround me all the time. My photos of that enormous owl are worth showing off. But God is more like the robin or the hummingbird, which everyone can see if they pay attention. The fireflies and beaver dams cannot be found where I live. But God is more like the squirrels and blue jays and mourning doves, which can be found everywhere. I was wowed by the remarkable wildlife on our trips. But God is more like the abiding presence of the familiar wildlife in my yard. I don’t mean to domesticate God. Just like the anoles and butterflies and frogs and robins in my yard have the ability to fascinate, surprise, and challenge me, there is much about God which is mysterious to me. But God’s constant presence is a comfort. I thank God that I got to experience the unique fauna of the mountains and plains this summer. And I praise God for God’s presence which surrounds me all the time like the wildlife in my own yard.